The European Conference on X-Ray Spectrometry (EXRS) 2014 follows the biennial conference series which started in Göteborg (1984, 1986) and continued in Vienna, Antwerp, Myconos, Budapest, Lisbon, Bologna, Krakow, Berlin, Alghero, Paris, Cavtat near Dubrovnik, Figueira da Foz and Vienna. Typically these conferences attract about 300 participants representing 40 countries. 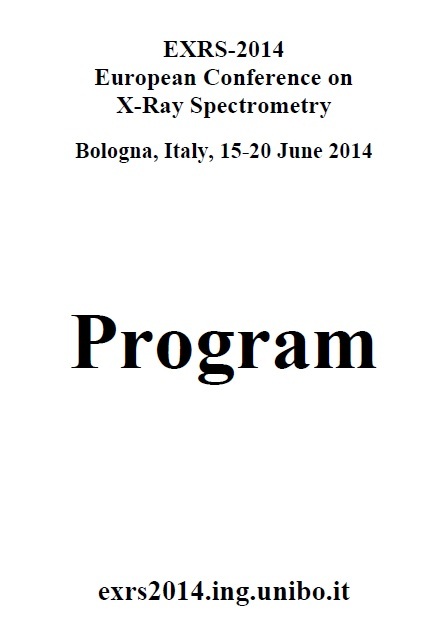 In 2014 the EXRS will take place in Bologna, Italy, where the Conference Organizers aim to bring together scientists active in basic and applied research and representatives of industry over a period of five days from June 15th to June 20th 2014. The conference will be held at the Belmeloro Complex belonging to the Alma Mater Studiorum University fo Bologna, in the core of the university district. Considering the continuous impact of new technologies and state-of-the-art instrumentation into the development of X-ray sources, optics, detectors and accessories, EXRS 2014 will constitute an excellent exhibition platform for your company. Therefore we would like to welcome you to take an advantage created by the gathering of high ranking representatives in this rapidly expanding field of science to introduce and demonstrate new products and developments in order to facilitate the decision-making process related to acquisition and/or upgrading both the experimental and analytical equipment. The exhibition will take place in the corridors of the A Building of the Belmeloro Complex. 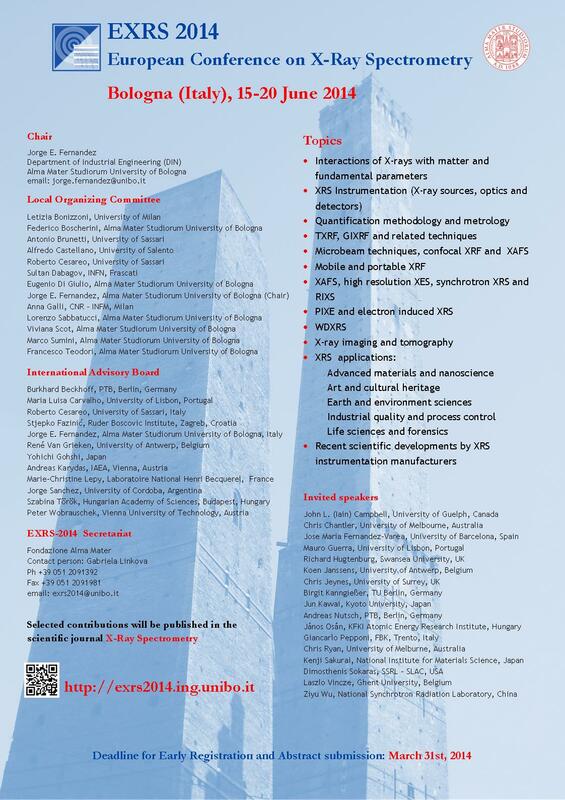 In addition to the participants to the Conference, the exhibition will be exposed to the delegates to the several satellite technical meetings organized contemporaneously in the Complex (Fundamental Parameters Initiative, European X-Ray Spectrometry Association-EXSA, International Radiation Physics Society -IRPS, etc.). To enhance the visibility of industrial products, the organizers have reserved three afternoon sessions dedicated to oral presentations given by industrial exhibitors. These sessions will be performed in Room B after the afternoon coffee break of Monday, Tuesday and Thursday. They are contemporaneous to the poster sessions and can be followed by a company's contributed aperitif. In all cases the list of exhibitors will be included in the printed conference programme and on the conference web site together with a link to the company’s website. Contribution of EUR 1000 covers the costs of distribution of promotional material inside the conference bags. Contribution of EUR 1500 covers the costs related to display and exhibit the company items (materials) in the Building A corridors (4 square metres of exhibit space with table, two chair, power supply, WIFI). This Contribution also covers the free registration for one person from the company. Contribution of EUR 1000 covers the organizational costs of a 15 minutes presentation in one of the industrial sessions which are foreseen for Monday, Tuesday and Thursday afternoon. This contribution does not covers the registration costs. Contribution of EUR 3000 covers the organizational costs for the cumulative options A, B and C.
Contribution of EUR 1500 covers the organizational costs of an aperitif at the end of one of the industrial sessions which are foreseen for Monday, Tuesday or Thursday afternoon. Cost of the conference bags with company logo printed near to the conference and University of Bologna logos. The contribution to the social activities will give the possibility to exhibitors to show the company labels during the specific event to increase the visibility of the own company. For more information about these alternatives please contact the organizers. Exhibitors are requested to complete the Exhibitors Registration Form. Further details on the access to the Belmeloro Complex, delivery of exhibition material and equipment, mounting and dismounting etc. will be provided to exhibitors in due course.